DEL REY was born in 1997 in the attic of a three-flat in Chicago's Ukrainian Village. Drawing on diverse backgrounds of Oberlin art-rock, Peoria punk, Scottish pipe drumming, and backwoods-Maine hallucinogenica (a highly combustible mixture of narcotics and electronics), del rey forged a swirling din of pounding, hypnotic rhythms, heroic harmony, and snaking, angular melodies. That is, until they were booted from the apartment by ungrateful neighbors. Fortunately, more friendly confines were soon found, and the rock has since continued unabated. 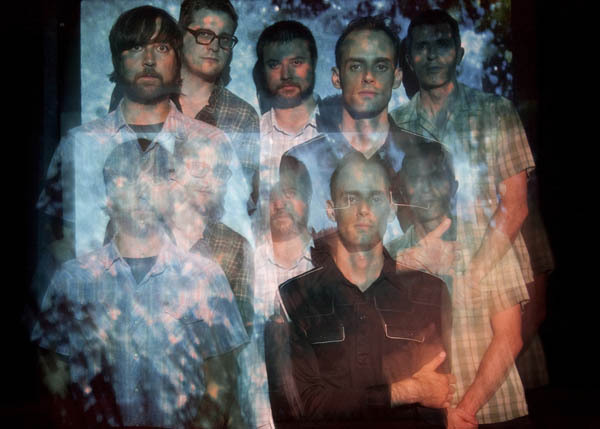 The group returned to the studio in 2008 to record the tracks for what would become Immemorial, their 4th full-length (At a Loss Recordings, Golden Antenna; 2010). During the tracking and mixing of the album, engineer Jason Ward joined the band, making the group a 5-piece and allowing even further experimentation in the studio and greater possibilities to translate the ever-more-detailed arrangments to the stage. The album features a stronger, wiser group firing on all cylinders, and the songs are more melodic and evocative than ever before. The music hasn't lost its bite, danger, or desperate edge, but it comes on with a clean, angular, cinematic style that has been honed to perfection. Del Rey continues to perform in Chicago and across the nation. Live, the music is infused with a feverish urgency, each song played like it could be their last. The signature of the group's shows is the symbiotic intricacy of their twin-drumkit attack, which manages to be punishing yet graceful at the same time.